As far as I know, you can search by multiple tags using the search textbox and typing "[tag1] [tag2] ... [tagN]", after that you'd get a bunch of questions with those tags. My question is, how can I show unanswered questions including those tasks? What I've tried so far is typing "[python] [recursion]" and then pressing the button "unanswered" but the result of questions are not including the beforementioned tags, what am I missing here? Questions with no answers and multiple tags, you could use [tag] [tag] [tag] answers:0 as search term. In the new-nav you could use https://stackoverflow.com/questions/tagged/tag%20tag?filter=need-answers&mode=all, which shows any question with tag, which has no accepted or positive scored answer. 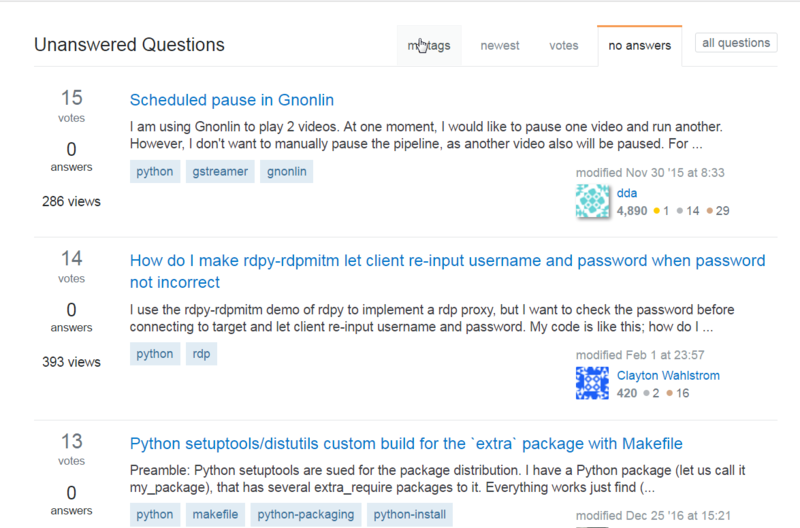 to show unanswered questions including the tags python and recursion. You can obviously exchange and/or add more tags to your search as well. How to deal with tags that could be considered redundant? Searching: exclude all but one tag.